Also forgot there is no goal line for both endzones (straight Ram Blue) Bizarre. 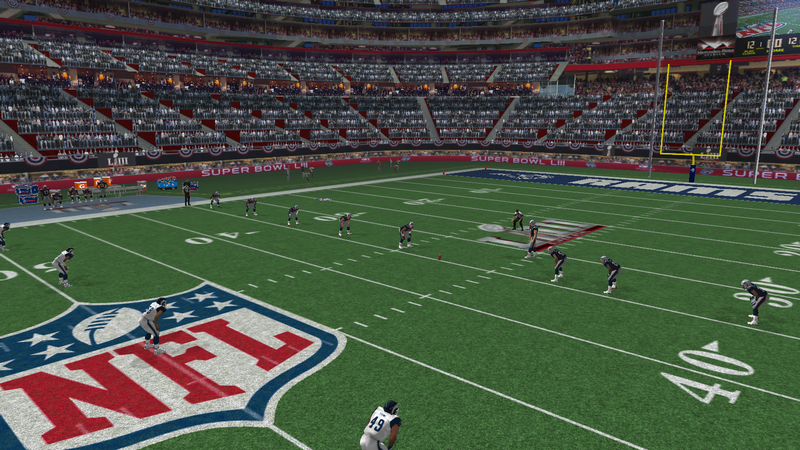 Yeah, there's a couple things going wrong here... the custom field isn't showing up nor are the custom stadium walls. I think what I need to do is check to see if this TPF needs to be updated to be compatible with the latest FF/FI mod. That will at least fix some of the issues. The issue I can't fix in this TPF is the wrong end zone art showing up... that's a FF/FI mod bug. Welp, I was wrong. I loaded it up and it worked fine for me. (see below) So, not sure what to tell you... I guess you made some changes with the DB Editor that is effecting this? Sorry. That's Okay. I will wait till the FINAL update is for the MOD. This season is over anyways. No worries. I will delete this season and I will be good to go. Then when the MOD comes out, hopefully it will be fixed right. Thanks.